The session began in the Regional section with variations on a couple of classics. First up was the Oak Knoll Manhattan, made with bonded bourbon, dry vermouth, and Danny Cymbal’s nod to Pasadena, the housemade mulled wine vermouth with locally grown spices and botanicals. 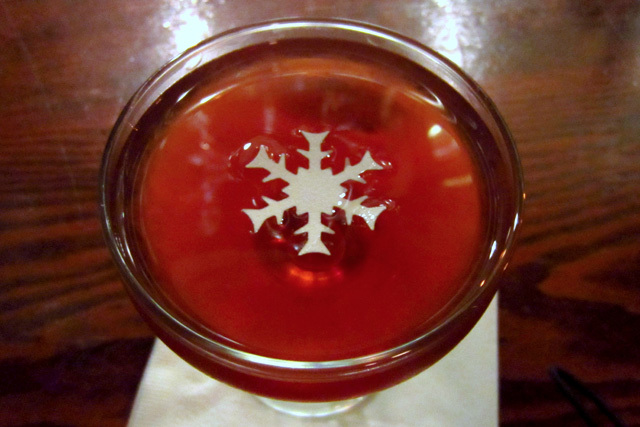 The dried sugar snowflake garnish is a helpful reminder that this fifth iteration of the 1886 menu is being offered in the middle of winter. Following on the popular Pimm’s Cup No. 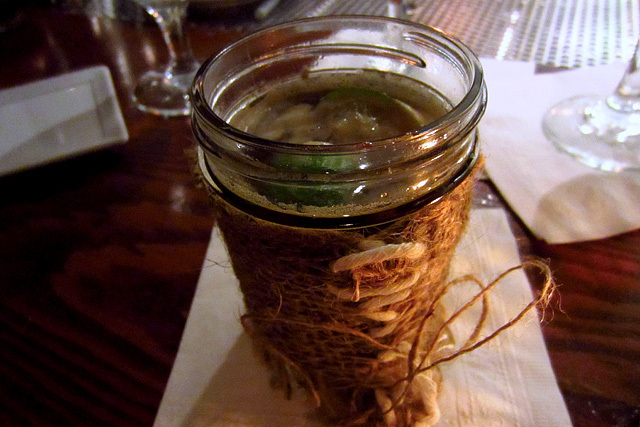 1 from the fall menu, the Pimm’s Cup No. 2 recalls another version of the Pimm’s Cup from the 1800’s, this time featuring a recreation of the Scotch-based Pimm’s No. 2, citrus juices, ginger, mint, cucumber and soda water. 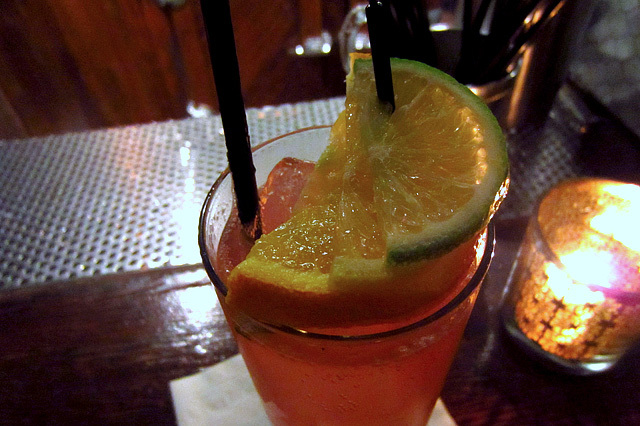 Winter menu notwithstanding, this tall drink could just as easily be sipped on the patio in the spring and summer. 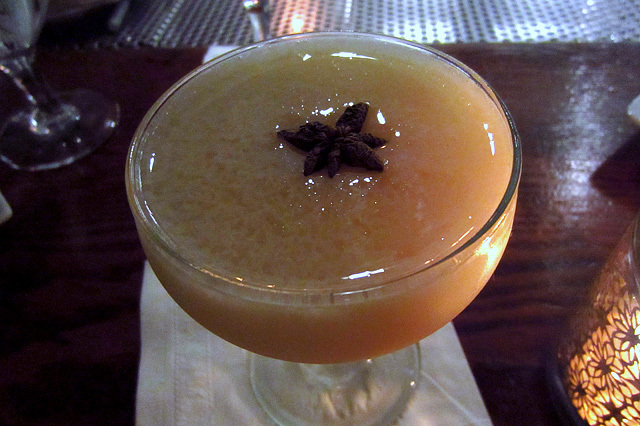 Next up was a Shaken cocktail, the Holland Daze by former Sotto bartender Kate Grutman. This latest in the 1886 crew’s series of cocktail shout outs is made with Bols Genever, housemade pistachio orgeat, Maraschino Liqueur, lemon and housemade sambuca bitters. After the bright and refreshing Pimm’s, the malty and tart Holland Daze was a nice bridge to the bolder winter drinks ahead. The tasting started to heat up with the Grog Logged, Greg Gertmenian’s Seasonal interpretation of traditional grog made with ale, sugar and lime. 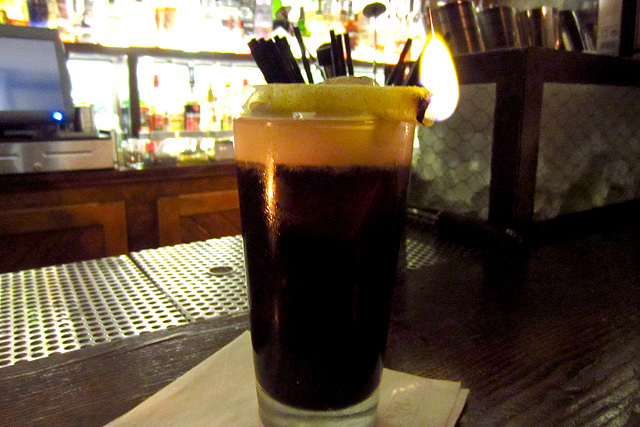 The mix of Black Rum and 1886 Grog is served hot, wrapped in a hand-sewn “ancient mariner” koozie, and “in the presence of the Lieutenant of the Watch,” in keeping with 1756 Naval Code (as noted in the menu). Naval regulations also called for grog to be served before noon and after the working day, and who are we to disobey orders? The Chic(ory) Flip is a Seasonal cocktail that honors the original recipe from the 1700’s, but with an added caffeine kick. Served cold, the Chic(ory) Flip is made with chicory coffee-infused rye whiskey, Yeti Stout, whole egg and caramelized chicory coffee sugar. The torched, blackened sugar may not be the most visually appealing topping for a drink, it but adds a smoky sweetness to the rich, textured sipper. 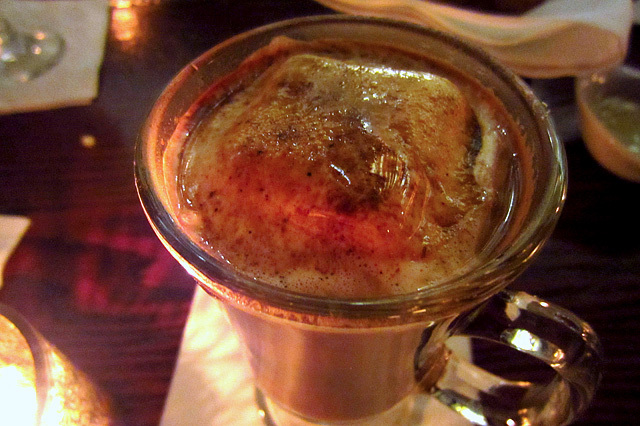 The Seasonal section wraps up with the Con Abuelita, a deconstructed version of traditional Mexican hot chocolate made with ancho chile-infused reposado tequila, 1886 Hot Chocolate Mix and an ancho chile marshmallow created by The Raymond’s pastry chef, Jeffrey Haines. Spicy, warm and comforting, just like abuelita (grandma) would want it to be. Perhaps the most talked-about drinks of the menu are featured in the Stirred section, where the winter theme truly comes through. 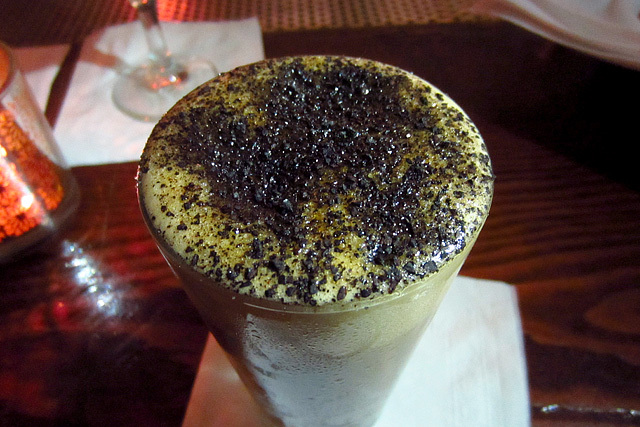 Brady Weise’s Coffee & Cigarettes is made with vodka, Dark Crème de Cacao, Yeti Stout and hand-whipped cream. To go with the “coffee,” Cymbal lit a hand-rolled, edible vanilla paper “cigarette” created by The Raymond’s chef, Tim Guiltinan. The excellent Coffee & Cigarettes is reminiscent of a White Russian, with strong chocolate and lightly bitter coffee notes. 1886 bartender Lacey Murillo was inspired by a scene from childhood and created The Smoking Jacket: imagine you’re peeking in on your grandfather enjoying a cigar and sipping his whiskey, and after he puts his cigar out in his glass, you sneak a sip. 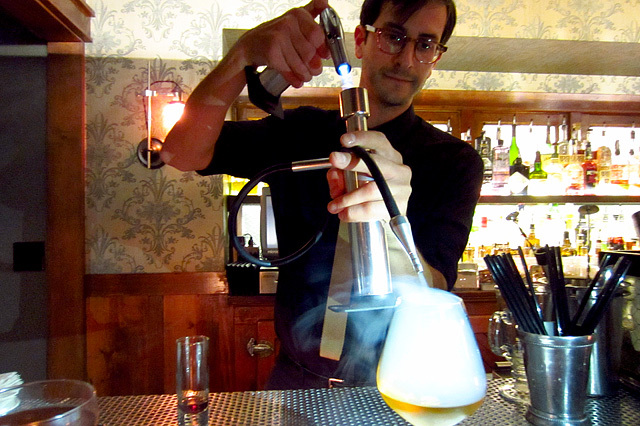 Murillo recreates this memory with Pot Still Irish Whiskey, 1886 tobacco bitters, Maplewood smoke and edible “ash” made with vanilla, orange and cream. 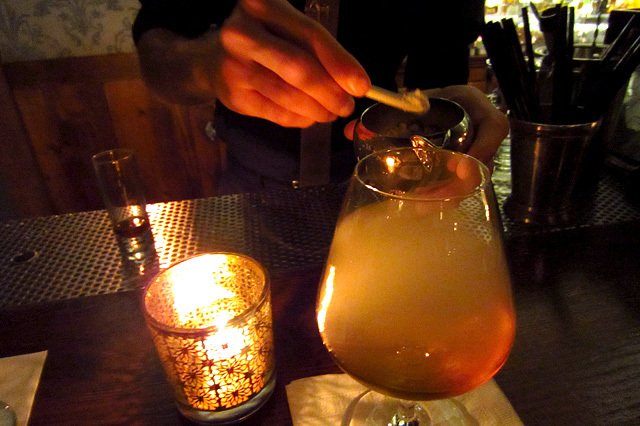 As noted in the menu, because The Smoking Jacket features bitters made out of tobacco, the drink comes with a Surgeon General’s Warning. 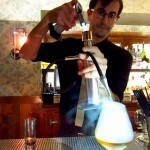 To serve The Smoking Jacket, Cymbal piped the smoke into a snifter, then added the ash just before serving the cocktail. The theatrical presentation isn’t the only reason why The Smoking Jacket is one of the most popular orders from the current menu. With wisps of lingering smoke greeting you with each sip, the warmth from the whiskey and mildly bittersweet finish, you’ll want to curl up with The Smoking Jacket and stick around for a while.